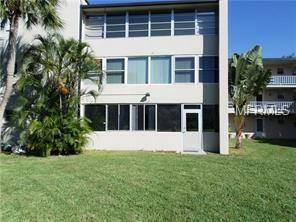 This is a 2 bedroom, 1 bath ground floor unit with a large Florida room and a large utility room. This unit is close to the laundry room. It is a very light and bright great room plan with spacious bedrooms, u-shaped kitchen and 4 piece bathroom. It overlooks the green belt with its seating area and community grill. Bay Pines is a 55+ community with a rec center, heated pool and shuffleboard. Just minutes to world class beaches, shopping, medical facilities and downtown St Petersburg. Sorry no pets please.